The Circular Flow of Income (CFI) refers to the continuous circulation of income and expenditure among the economic agents. The following illustrates the CFI through a simple model of an economy, which excludes the Government Sector and Foreign Trade Sector. Firms employ the factors of production and make payments to households in the form of rent, wages and salaries, interest and profits. 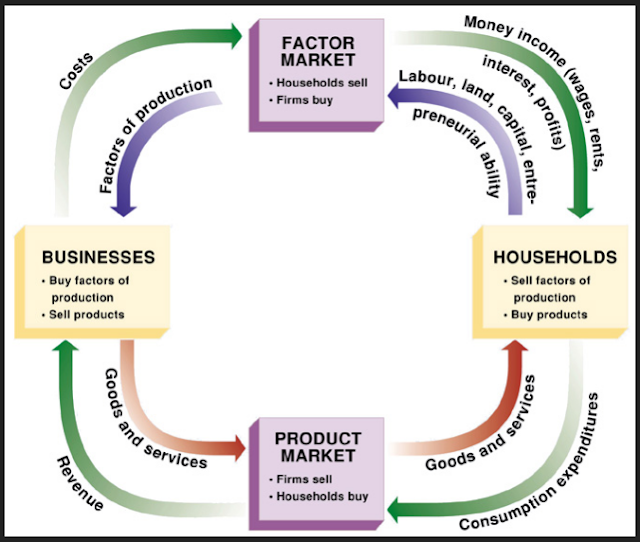 Households use their income to buy goods and services form firms. 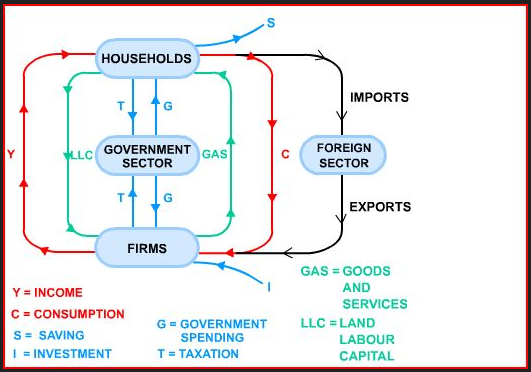 The following diagram illustrates the CFI in an economy with Households, Firms, the Government and Foreign Trade Sectors. Remember, the four sector model includes the income withdrawn from and injections into the economy. The following assumptions will help you to study the realistic model. Investment of firms in the production of capital goods is an addition to the CFI. Government is the major buyer and employer in the economy. It spends on goods and services and salaries and wages. Majority of income is injected into the economy from the government. Domestic households and firms receive income by exporting goods and services abroad. It is an injection of income into the economy. Saving refers to that part of consumer income that is kept aside for future use. It is a leakage as it does not come into the CFI in the form of household spending. Taxes levied on income and spending is a withdrawal form the CFI. Import of goods and services is followed by an outflow of currency. Therefore, it is a leakage. Equilibrium refers to a state of balance. The national Income is said to be in Equilibrium when Injections are exactly equal to Leakages. Therefore, (I+G+X) = (S+T+M). When (I+G+X) > (S+T+M), the value of CFI increases leading to a rise in employment and National Income. When (S+T+M) > (I+G+X), the value of CFI decreases leading to a fall in employment and National Income. In order to change the value of the CFI, the government uses Fiscal and Monetary policies.